LAT: 7:35, no errors. Newsday: 5:59, no errors. WSJ: 10:29, no errors. Croce at 4:00. No Googles, but several people I don’t know: TYGA, KERI, QUESTLOVE, NEILL. Also, ACES. Had “hocuS pocus” before OPEN SESAME, and “Scholarship” before STUDENT LOAN. Had to clean up the ensuing mess. @Vidwan – Hubster loved the jokes. Forgot a couple of puzzles: Jones: 21:02, no errors (by some miracle, as there were several things I had to guess at). CHE: 12:36, no errors. 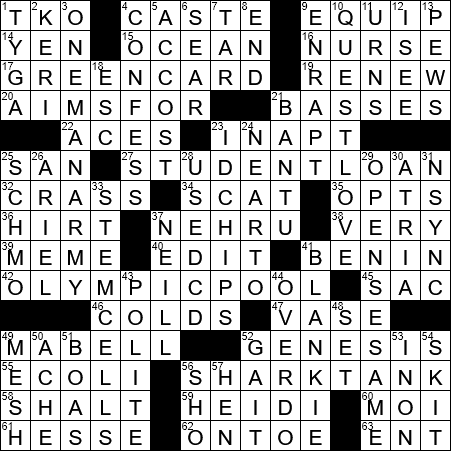 Fun puzzle, especially because it has my name in it! Wouldn’t the opposite of “rise” be “sit”? Unless it’s referring to bread rising – but then what is “set” in that context? Or maybe it’s totally something else! ARIEL and BANTU. A bit harder than yesterday. @gail SET as in the sunset or sunrise. Why didn’t I think of that? So simple. I feel really dumb! LAT: 10:33, no errors. Very difficult for the day. WSJ: 6:56, 7 errors. Lots of screwed up nonsense in one section of the grid. Newsday: 7:29, no errors. Jones: 7:38, no errors. When I was a Peace Corps volunteer in Nigeria in the 1960s, Benin was the capital of the Mid-Western region in south-central Nigeria, the Niger River delta area. The city was known for its famous Benin bronzes that made early European explorers think that the locals could not have made them. It was the Benin Empire that gave its name to the Bight of Benin, not the other way around. I traveled through Dahomey and Upper Volta. Ghana had already changed its name from the Gold Coast when I spent several days there. Music Meta: 34:37, no errors I’m aware of. Meta solved. 9 mins 35 sec, and no errors. Seems long for a Tuesday, but then again, Jeff Chen is co-author of this grid, so I should be lucky to even be able to finish it at all. Tim Croce’s latest: no errors. At 55:43, I filled in the final square, but there were three squares I wasn’t quite sure of, so I let the puzzle sit for a few minutes; when I got back to it, I realized there was a better choice for one of the three and changed it, at which point the elapsed time was about 1:02:00. Not the most difficult Croce, but with a couple of tricky spots. I had an easier time and enjoyed this puzzle! Didn’t know that Jeff Chen was involved or I wojlc have been more nervous … maybe one of his easiest puzzles . !!?!! Thank you Madame Jane Blando for the compliment of a borrowed joke. It come to mind when I typed in the V of Louis XIV…. Caste in India is known better as varna. Originally it was a formal division of labor but then it became hereditary and inflexible .. I am not defending it by any means… incidentally the highest caste, the Brahmins (. Priests, scribes) were not the richest . and the richest were the Vaishya’s… the businessmen etc the number 3 caste. A gandhi, is s cloth merchant … so the Gandhis belonged to the business caste. Jerry, the Peace Corps volunteer … you may have been in Nigeria during the civil war when Biafra chose to secede and 2 millions in the area died of famine and starvation during the blockade of the war. That was between 1967 – 1970. I still have Biafran pound notes from that period. They are cheap and still readily available. No errors. As usual, I forgot the spelling of NEHRU– whenever it’s in a puzzle I just ink in the N and the U, then wait for crosses to fill in the rest!! !🤔 You’d think I’d know it by now….a certain few words always trip me up…. like “occasionally.” !! !😮 Always want to spell with double S!! Why do only certain words get us? My dad had an Al HIRT record when we were kids…it must have been late 60s, cuz Hirt was dressed kinda like a hippie, and the album included “Scarborough Fair”– my big brother thought that was especially cool.